Katarina Nash cruised to the win. The moon was full, the Las Vegas lights shimmered in the distance, the crowds were noisy and the racing was hot at CrossVegas. In a show of force, Czech National Cyclocross Champion Katerina Nash (Luna Pro Team) soloed to victory, her first at the race after taking second the past two years. From the start of the race, the women of Luna Pro Team were in total control of the 40-minute race. Nash and her teammates Georgia Gould, and Amy Dombroski went immediately to the front and established a fast paced tempo. 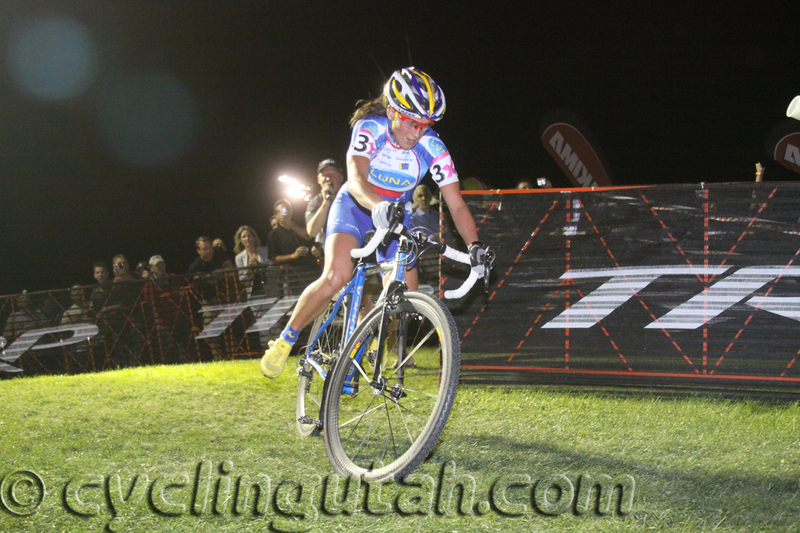 Joining the lead group was former US National cross country champion, Mary McConneloug (Kenda/Seven Cycles). With three laps to go Nash attacked hard and established a huge lead. The battle was on for the remaining podium slots. “I knew where my race was and I had to be smart about it. I was pretty much soft-pedaling on the front, neither of them would come around. Finally a little bit of help on windy sections but got a little blocked off on the last hillclimb,” said McConneloug. Though McConneloug pressed the Luna Pro Team riders, Dombroski timed her attack in the final lap and prevailed to take second. McConneloug came in third, with Gould finishing fourth. 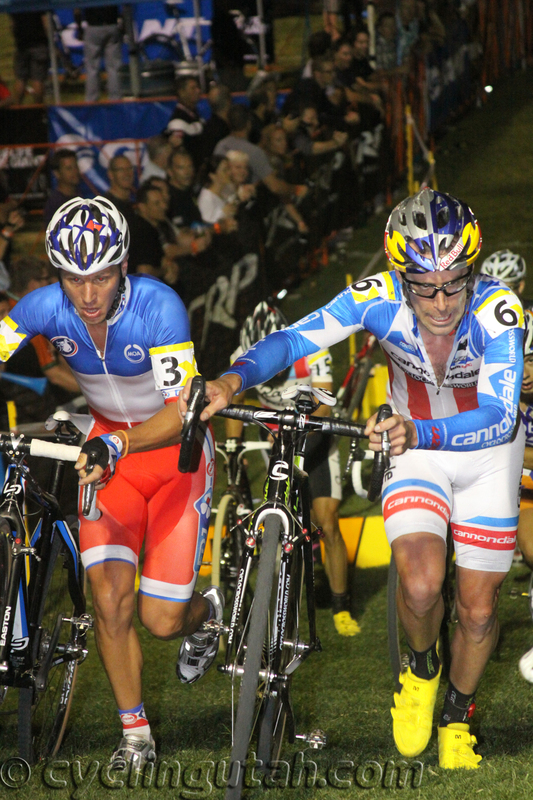 Francis Mourey (left) won the race in a dramatic sprint. Tim Johnson is on the right. The Elite Men's race looked to be a repeat of last year when defending champion Jamey Driscoll Cannondale/Cyclocrossworld.com) took a solo flyer halfway through the race and looked to set to repeat. But that wasn't counting on French Cyclocross Champion Francis Mourey (FDJ), just coming off from back-to-back wins in Seattle, who nipped Driscoll at the line after a final lap surge to take the win. “It's a bummer to be out there and try so hard and get nipped by half a wheel at the line, but his reputation precedes him, he's a darned good bike rider.” Driscoll said after the race. Two laps into the 60-minute race, Driscoll attacked the lead group and managed to build a gap of up to 24 seconds. Behind him, a chase group was formed which included Ryan Trebon (Kona), Chris Jones (Rapha Focus), Jonathan Page (Planet Bike), Christian Heule (Vc Gippingen Champion System), Gerben De Knegt (Rabobank-Giant Off Road) and Driscoll's teammates US National Cyclocross Champion Tim Johnson and Jeremy Powers. Even though Johnson and Powers were playing defense, the gap slowly started to come down, with Trebon and Jones taking turns at the front. Tired from traveling, the Frenchman bidded his time in the group.“I knew that I had a chance to win in a sprint and I wagered my race on a sprint and it worked”. With half a lap to go, Mourey put in a huge surge and was able to sprint ahead of Driscoll to pip him at the line. De Knegt came in third right after Driscoll.